On Wednesday, May 3, Sabine Dutoit, Nancy Bray, and I enjoyed the unusually hot (88° according to the thermometer at the McKenzie Ranger Station!) but gorgeous day roadside botanizing in the McKenzie area. Nancy had never been to the beautiful seepy roadbanks along Deer Creek Road 2654, and Sabine and I hadn’t been for 3 years (see Triple Treat up the McKenzie). With all the rain we’ve had, I figured the area would be at its best this year. 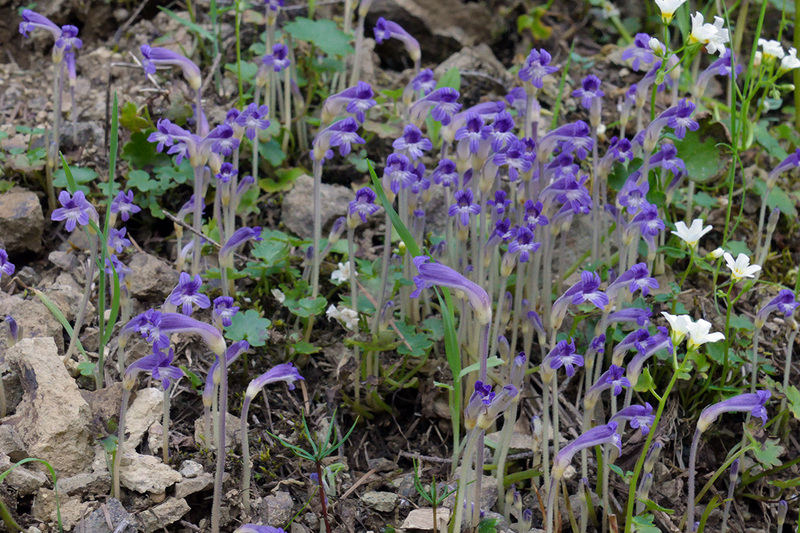 Shelton’s violet, growing on mossy rocks. Note the red buds. The back of the petals are red as well. While it was still early, we weren’t disappointed with what was already in bloom. Yellow was definitely the color of the day. 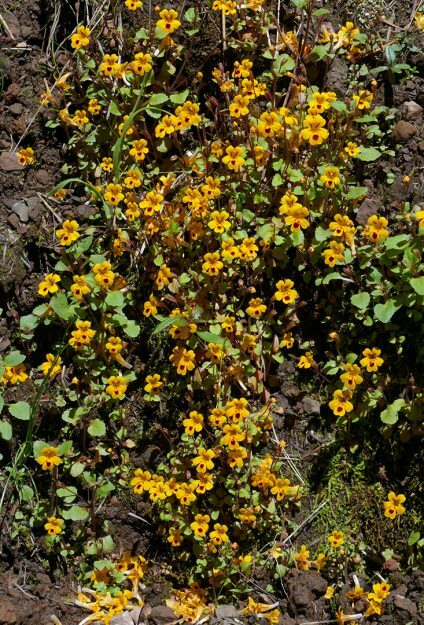 Masses of gold stars (Crocidium multicaule) and seep monkeyflower (let’s just continue to call this Mimulus guttatus, for the moment) brightened up the roadside, the monkeyflowers just a bit more orange than the gold stars. Thick patches of chickweed monkeyflower (M. alsinoides) and Hall’s lomatium (Lomatium hallii) continued the yellow theme. 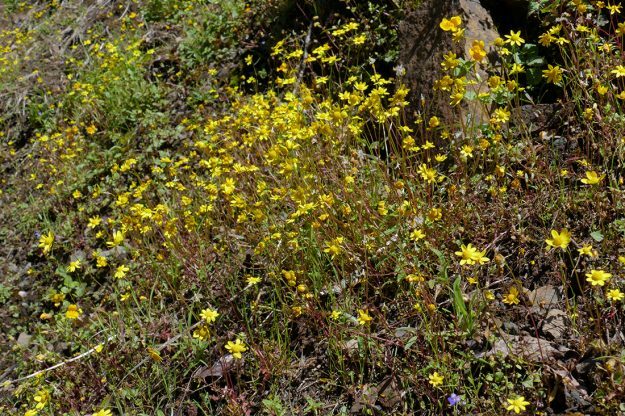 On a quick climb up one rocky section of roadbank, I also found some yellow-flowered Shelton’s violet (Viola sheltonii). Other than some early-blooming larkspurs (Delphinium menziesii) and small-flowered Blue-eyed Mary (Collinsia parviflora), the rest of the flowers were white. These were primarily the two saxifrages, Micranthes rufidula and M. integrifolia, but near some of the seepiest spots, there were nice sweeps of Thompson’s mistmaiden (Romanzoffia thompsonii) and under trees were a number of white Lyall’s anemone (Anemone lyallii). Gold stars bloom profusely during a wet spring. Some were starting to go to seed, so I was able to collect lots of seed. I’m still hoping to get it established on the rocky seep on my own property. I climbed up to the western meadow above the road alone, the other two not wanting to deal with steep rocky slope on this day. I was hoping to see what stage the gorgeous shooting stars (Dodecatheon pulchellum) were at, but I couldn’t even spot the leaves. 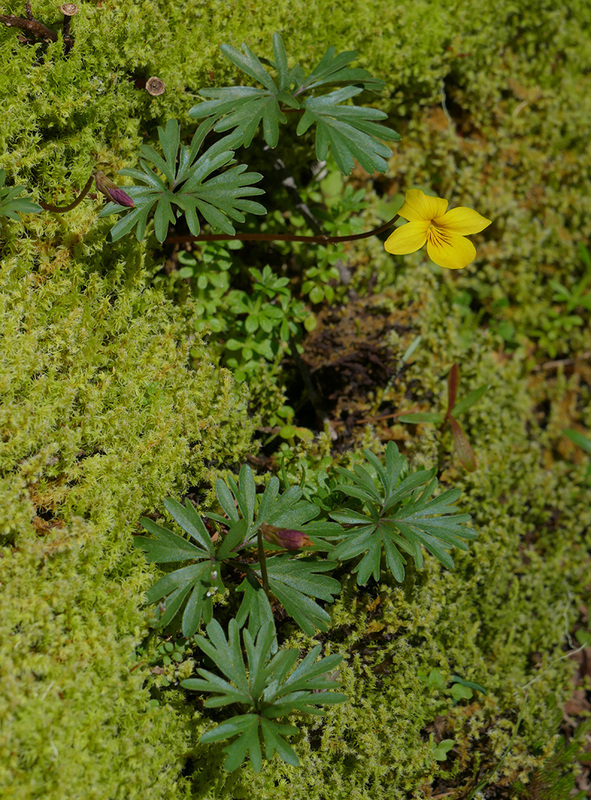 I did get to photograph a Moss’s elfin flitting from one saxifrage to the next. It was still extremely wet, and I tried to stay in what appeared to be deer footsteps, not wanting to step on any of the abundant plants clinging to the steep slope. No pink shooting stars yet, but there were lovely fairly slippers (Calypso bulbosa) in the woods on the way up to the meadow. The creek to the east of the meadow flows down to the road where we saw loads of drooping leaves of bronze bells (Anticlea occidentalis) hiding under a tree, worth a trip back much later to see them in bloom. After we left, we stopped along the cliffs along McKenzie Highway and found some shooting stars in early bud, so they’ll still be a while up in the west meadow. They were in full bloom there on April 30, 2014, our previous trip, so we are definitely—and not surprisingly—weeks behind that year. I’ve no doubt we’re also way behind the last two years of drought. We had hoped that the hot weather would bring out the butterflies, and it certainly did. As at Hills Creek Reservoir (see previous post), there were lots of California tortoiseshells, and they were just as friendly. All three of us were repeatedly greeted by torties, landing on our hats, shirts, and pants. I guess sweat is as tasty as nectar to some—me, I prefer sweets to salty foods. I’m so happy to see their population bounce back. 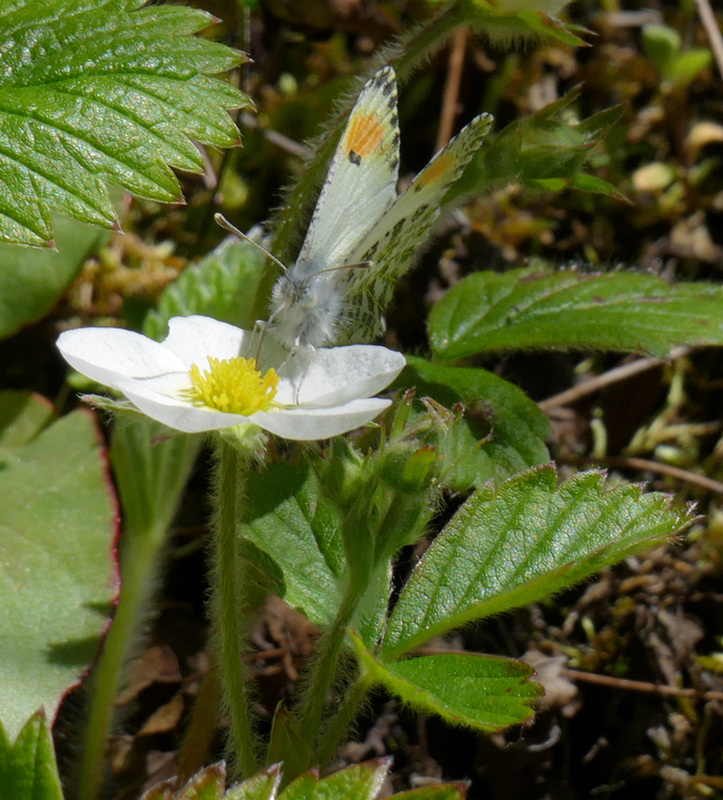 We also saw several green commas and Sara orangetips. 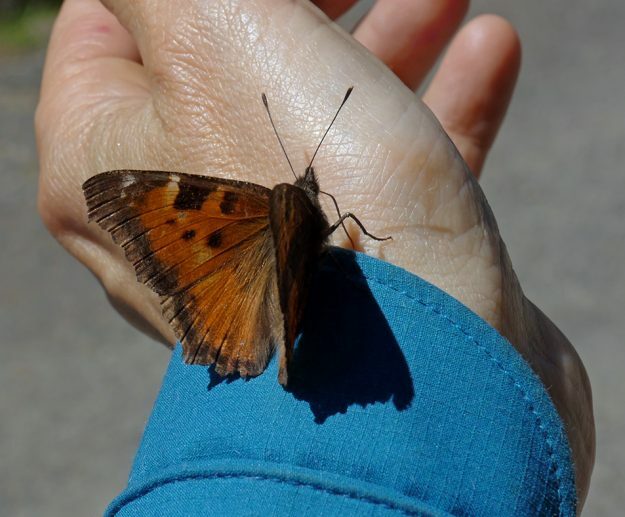 Along the McKenzie Highway cliffs, we saw one red admiral as well as more of the others, and at Cougar Reservoir I watched a Moss’s elfin nectaring on a number of monkeyflowers, a flower I’ve rarely seen butterflies visit. This tortoiseshell moved from my right to my left arm to allow me to photograph it more easily. How thoughful! Since it was still only mid-afternoon, we made one last stop, at the dam at Cougar Reservoir. Oddly the monkeyflowers were just beginning there, but the saxifrages and California mistmaiden (Romanzoffia californica) were outstanding. What I really wanted to look for was the naked broomrape (Orobanche uniflora) that grows abundantly right by the milepost 55 marker just north of the dam. They were amazing when the three of us visited the spot on April 21, 2015 (see Attack of the Orobanche). They weren’t quite at peak yet on this trip, but we were thrilled at how many were in bloom already. An excellent finale to a wonderful day. To see these, park at a small pullout on the east side of the road (best to do this on the way north as there is limited visibility to cross lanes here) right across from MP55, walk to the post, and look up and down. They are everywhere! How the California mistmaidens survive this many parasitic broomrapes, I don’t know. They seem to be outnumbered. 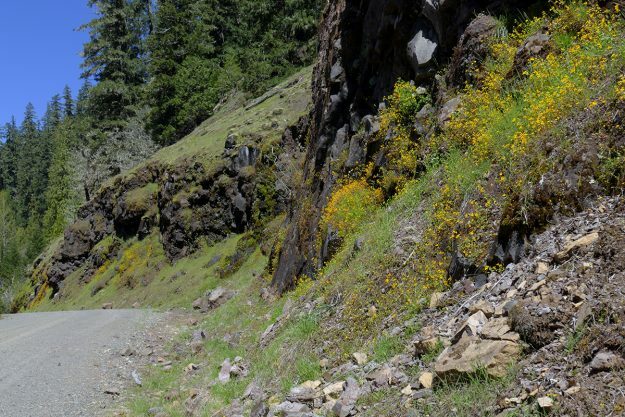 If you’re looking for an easy place to see a beautiful display of flowers, I’d highly recommend driving up Deer Creek Road anytime in the next month or so. There are plenty of other species yet to bloom and lots of snow higher up the ridge to keep fueling the seeps, even when the rain starts to taper off. Take Hwy 126 east past McKenzie Bridge. Continue 7.5 miles past the McKenzie Ranger Station (3 miles south of Trail Bridge Reservoir). Turn left on Deer Creek Road 2654. Drive about 2.5 miles, just a little ways past a hard bend at Fritz Creek. Along the next 1.5 miles, there are about 13 creeks and seeps spilling down onto the road bank. Several partly hidden meadows can be explored with a short scramble up the steep road bank. Can’t wait to get up there! Thanks Tanya. Great butterfly shots, Tanya! And Sara’s Orangetip,my favorite!